There are two worlds in Neeyum Njanum: the old and the new. 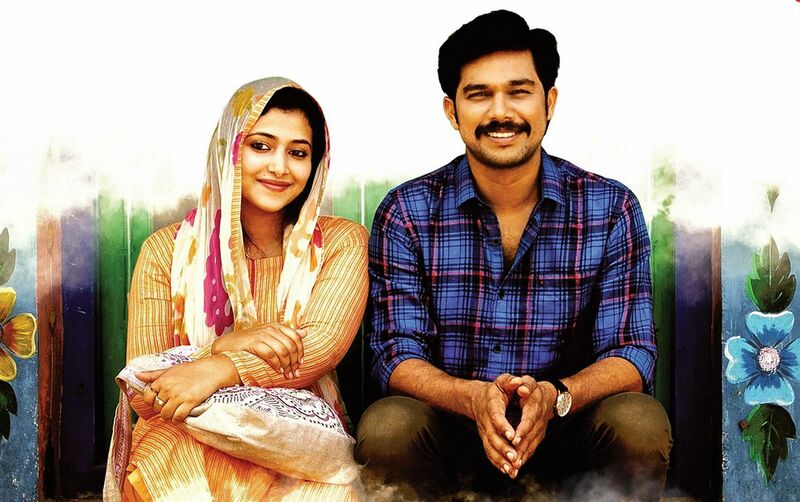 It’s a new-age love story that celebrates old-school values, and director AK Sajan neatly balances the two sensibilities. The two lovers in the story, Yakub (Sharaf U Dheen) and Hashmi (Anu Sithara), live in the world of radio, attar, letters, and classical music. They even move into a traditional mansion — the kind that’s usually found in horror films. But this is not a horror film. Yakub is a 'lover not a fighter' type who quits the police force to pursue his love for photography and a relationship with Hashmi. But there is a slight complication: Hashmi hasn’t quite gotten over her past flame Shanu (Siju Wilson). Being the relentless man that he is, Yakub finally manages to win her over. However, adversity is going to rear its ugly head soon. In the first half, the film seems to be going in the direction of the 1981 Tamil film, Antha Ezhu Naatkal (remade as Woh 7 Din in Hindi), or Krishnagudiyil Oru Pranayakalathu (1997). But Sajan has other plans, and he does something completely unexpected to the classic love triangle which I found welcoming and thoroughly enjoyable. My expectations were upended at every turn. The film is never in a rush. It takes its own time setting up the two lovers’ convincing chemistry. Some may find the lengthy runtime (2 hr 40 min) slightly unbearable, but patient viewers are sure to be rewarded. This is a film that, I felt, benefitted greatly because of its length. Apart from shaving off maybe a song or two, I don’t see any reason to shorten the runtime. The entire film is constructed like a novel. Sajan uses the extra time to get you acquainted with the texture of the characters’ world and incorporate some brilliantly heartwarming flourishes (for example, a rat saved from its trap returns the favour to the saviour in a later scene). Though Hashmi and Yakub’s story brings its share of intense moments, the second half carries a relatively more humorous tone, with issues like moral policing and communal violence handled with a remarkably satirical approach. We have seen similar issues addressed in last year’s Varathan and Uncle but not in such an ingenious, comical manner as it is presented here. While a group of Muslims cite the Quran as an excuse to intimidate a girl and boy, a group of Hindus sees in this a splendid opportunity to win in the upcoming election. All this is complemented by some well-placed humour, reminiscent of that found in a Quentin Tarantino film (minus the gore, of course). This half of the film is essentially a long, tension-laden climax with four different things going on at the same time. Just when you feel slightly overwhelmed by the seriousness of Hashmi’s situation, Sajan switches to two hilarious situations running concurrently—one in the next house and the other a few kilometers away from these two homes. Their significance begins to make sense once you’ve seen how everything is wrapped up in the end. Neeyum Njanum is yet another addition to Sharaf U Dheen’s filmography that not only proves his versatility, but also his leading man capabilities. Sharaf is perfectly cast as the good-intentioned, soft-hearted youngster who is weighed down by the unusually trying situations thrown his way. He goes from sprightly in the first half to dejected and weary in the second and is aided by a suitably strong and sensitive performance from Anu Sithara. Siju Wilson is the mystery man from Hashmi’s past who contributes a layer of unpredictability to the proceedings. Vishnu Unnikrishnan plays Ganapathy, a Hindu guy in love with a Muslim girl. His role has a bigger significance in the film’s latter portions. Ganapathy is someone who discovers that his neighbourhood is not as loving as it once seemed to be. Though Sajan occasionally shows a tendency to veer into melodrama, he thankfully doesn’t go all the way in. There is no room for tragedy here. You’ve never seen the filmmaker this laid-back before. The cumulative effect is that of getting candy from the doctor after getting a not-so-painful injection.